IDP is running a special mobile web site offer for $399. 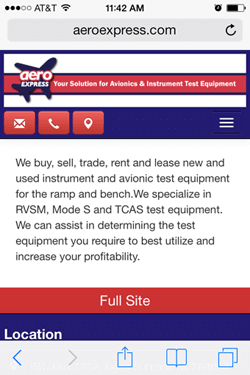 Get a 3 page mobile web site for your business. Google Analytics will show you that your mobile users who access your web site consistently bounce off of your site when they realize it is not mobile friendly. A simple mobile web site does not cost a lot of money. You can setup a basic mobile web site that allows users to easily access your phone number, physical location and email. Don’t lose business because your are not mobile friendly! Here are some examples we have recently completed. You will have to pull them up on your phone to see the mobile version. Of course you can do more of a robust mobile site if you want but a simple 3 page mobile site works pretty well. Contact information front and center. Contact us today to build your mobile web site.